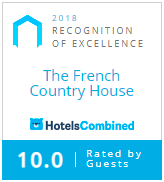 If you are looking for luxury Tauranga accommodation whilst on a weekend escape, special holiday or a romantic getaway, The French Country House will enchant. Nestled in the hills, the views from the balcony over the Bay of Plenty countryside to the sea are spectacular. The French Country House offers four luxury bedrooms. Our living areas are spacious, light and relaxing, with the pairing of luxury antique furnishings and comfortable modern facilities. The farmhouse is designed to offer individual privacy for romantic getaways or corporate retreats, with excellent access to explore this beautiful region.